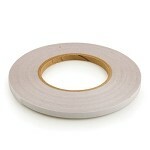 1/2" Seam Tape helps to stop seam leakage and eliminate canvas slippage while sewing. Roll the tape onto the seam being sewn, peel off the paper backing and apply the other side of the canvas and sew away. Works great as a sealer when replacing plastic windows. Apply tape around the old window, place the new cut plastic (over sized) onto the tape and sew two stitches all around the plastic being replaced. After sewing, trim off excess plastic, turn the window around and cut out the old plastic. You now have a new plastic window that has waterproof seams. Q: Does the Seam/Basting Tape stick to the needle when I am sewing through it? Q: Is this seam tape waterproof? Yes it is in regards to stopping water from seeping in between two fabrics sewn together. Q: I need 60' of this. How much is on a roll? There is 36 yards in a roll.